ReutersIraqi soldiers secure civilians who fled from the formerly ISIS-controlled town of Fallujah on June 18, 2016. 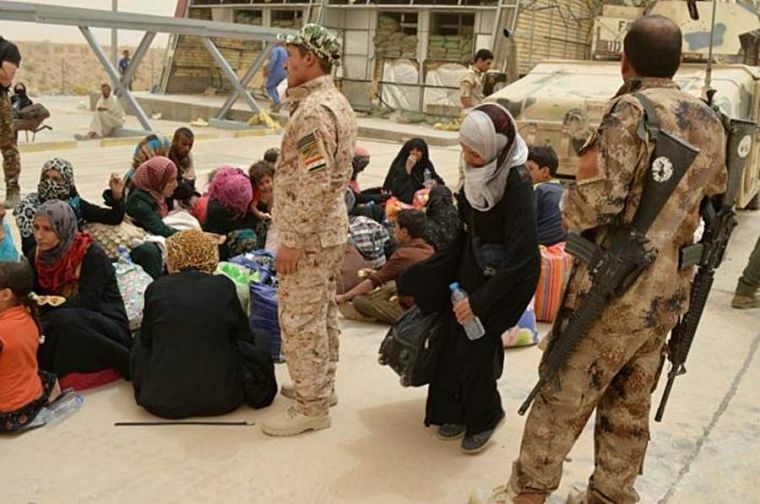 Under the threat of the Islamic State (ISIS), thousands of residents from Fallujah, Iraq, have fled to a refugee town called City of Refuge. And in the last 18 months, Frontiers USA said that through the work of missionaries, over 140 refugees have converted to Christianity. Frontiers president Bob Blincoe said after Iraqi forces recaptured Fallujah, some of the new Iraqi Christians want to go back to their homes and share their newfound hope with their neighbours. "They are attracted to go home because that is the place they knew as where they lived their lives," said Blincoe, according to Mission Network News. "And there's no future for them in the refugee tents in the City of Refuge." "But now they have a mission, and they feel jubilant in the Lord. They have been baptised, most of these groups that they're working with have been baptised," he said. He said the reason why Muslim refugees have accepted Christ was because of Jesus' words, "Come to me all who are weary and heavy laden. Learn of me, I will give you rest for your souls, for I am meek and humble." "This way of the Lord, this unexpected hope for miserable people, for desperate people, is the number one reason," he said. The new Christians are sharing the Gospel to their family and friends. "This is driven by Muslims who have come to faith themselves, which is the thing that of course must happen," Blincoe said. Blincoe shared the testimony made by Layla who fled Fallujah together with her husband and children. "They fled on foot, losing ground to the upcoming cloud of the enemy cars and trucks heading their way when, to their great surprise, a pickup truck slowed down and stopped and [the driver] said, 'Get in the back,'" he said. At the refugee camp, he said, "God gave this woman, Layla, this vision of a man who would tell her about Jesus. That happens, I'm not going to say 'often', but it's often the entry into people hearing from the Lord. That fellow…was distributing goods and he came to her house the next day and offered to open up the Bible with them." Blincoe added that "now the real contest for the soul of Iraq begins." "We have a sense that we are on the frontlines of the free world. That everything depends on winning the people that have been displaced by ISIS, them going back to their homes, and winning those parts of Iraq where no missionaries can set foot," he said. He's now asking for prayers for the extension of the Gospel in Iraq.